Westhaven is often likened to a Rockwell painting. Wander the streets and you’ll see charm everywhere. The neighborhood is an updated throwback to the nostalgic times we’ve all grown to love. Please take a few minutes to tour the perfect example of what buyers are looking for—a walkable, mixed-use neighborhood. You won’t want to leave. 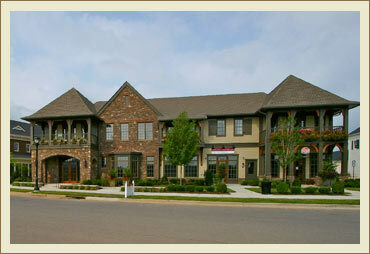 The classic, Southern style, 15,000 sq ft Residents Center is located at 400 Cheltenham Avenue. It features a 37-seat Theater, Banquet Hall with kitchen, state-of-the art Fitness Center, Art Room,Playroom,and Movement Room for Yoga, Weight Training and Pilates, with dedicated instructors. Parties, club meetings, classes, and weddings, etc. are held in this facility. The perfect “StayCation”: Located behind the Residents’ Club, the Resort Pool complex consists of a large family pool with lazy river current, an exciting waterslide, fenced baby pool and fun sprinklers. The café even serves drinks and food poolside. Why travel, when you can play minutes from your house and then sleep in your own bed? 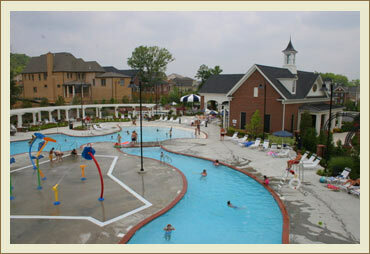 The adult pool, adjacent to the resort pool is heated and saltwater to provide extra comfort. This is a popular gathering spot for adults to quietly enjoy a book or to socialize with snacks and drink. 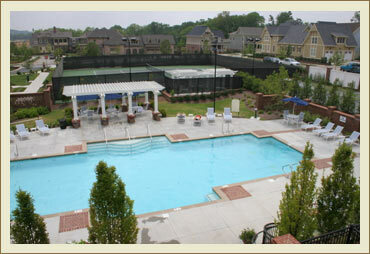 The tennis courts are next to the Residents’ Center: Tennis lessons for adults and children are held regularly. 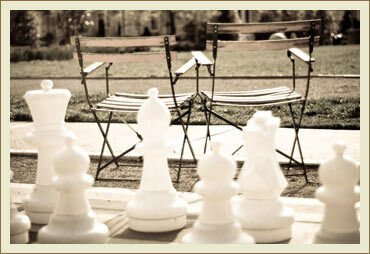 The Chess Park is surrounded by includes a huge chess set, a bocce ball court, and lots of space for croquet, Frisbee throwing, or a multitude of other activities. There are tables and chairs for playing cards or board games or just relaxing. The largest of the three playgrounds, located next to the pools, is fenced and the ground is covered with shredded, recycled rubber, so children can run and play safely. There is also a basketball court nearby. 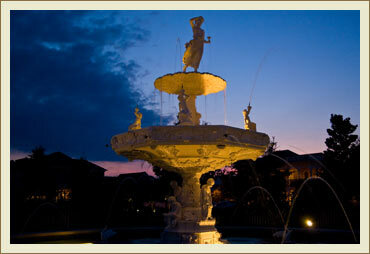 The ornate Westhaven fountain, with its beautiful landscaping and park benches, is a replica of the famous Forsythe Fountain in Savannah, Georgia. It’s another favorite gathering spot for concerts, weddings, and the annual Plant Sale. Local nurseries bring in plants and accessories for residents to conveniently buy. The picturesque streetscapes—lush parks, overflowing flower boxes, meandering creeks, lovely bridges, fishing ponds, and mature trees– sets Westhaven apart from all other neighborhoods. The street trees will eventually form a green canopy above the streets. And each home is equipped with an irrigation system to enhance the beauty. There’s even a “Flower Lady” who can help residents plant those window boxes and porch pots. Summer outdoor concerts are held on the Great Lawn behind the Residents Center. Residents tote lawn chairs and snacks to enjoy a wide variety of music, thanks to the superb events planner. It’s just one more opportunity to socialize and soak up the culture of the area. The Town Center boasts Vanderbilt doctors, a dentist, Franklin Endodontics, Optical Shop, Insurance Agency, a postal center, a wine shop, a beauty salon, Freeman’s Flowers, Edward Jones financial services, a dry cleaners, restaurants and Kroger grocery store. Along with The Academy at Westhaven, an award-winning day care facility, more retail shops and restaurants are coming soon. If you don’t feel like walking, a street-legal “golf cart” is another choice; you’ll see them lined up here, there and everywhere. Just grab your s’mores ingredients and head to the community firepit to pretend you’re camping out. 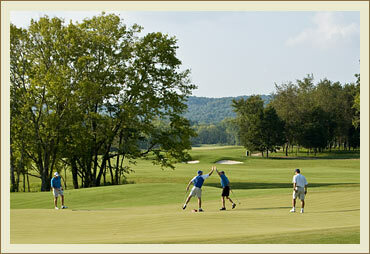 Check out the amazing 18 hole golf course located on the West end of the neighborhood. The recent creation of The Golf Academy at Westhaven is under the leadership of nationally recognized instructor Virgil Herring. The clubhouse sits overlooking the course. Pearre Creek Elementary School, located within Westhaven, opened in the Fall of 2010. It’s just one more reason to live in Westhaven. Community and staff involvement have helped to ensure a smooth and successful start-up year.